Discover out-of-the-way places like Muir Woods National Monument and San Francisco Bay. Get in touch with nature at Alcatraz Island and Twin Peaks. The adventure continues: snap pictures at Golden Gate Bridge, go for a walk through Fisherman's Wharf, make a trip to Golden Gate Park, and see the interesting displays at Exploratorium. To see reviews, maps, and more tourist information, you can read our San Francisco trip site . The Route module can give you travel options from your home to San Francisco. Expect a daytime high around 62°F in February, and nighttime lows around 48°F. Finish your sightseeing early on the 13th (Wed) so you can travel to Seattle. Discover out-of-the-way places like Murhut Falls and Snoqualmie Falls. Step out of Seattle to go to Issaquah and see Duthie Hill Park, which is approximately 54 minutes away. And it doesn't end there: get a taste of the local shopping with Pike Place Market, examine the collection at The Museum of Flight, meet the residents at Seattle Aquarium, and stroll through Kerry Park. To find where to stay, ratings, reviews, and more tourist information, you can read our Seattle trip planner . Getting from San Francisco to Seattle by flight takes about 4.5 hours. Other options: do a combination of train and flight; or drive. Prepare for slightly colder weather when traveling from San Francisco in February: high temperatures in Seattle hover around 50°F and lows are around 40°F. Wrap up your sightseeing on the 16th (Sat) early enough to travel to Portland. Eschew the tourist crowds and head to Haystack Rock and Cannon Beach. Get in touch with nature at Columbia River Gorge National Scenic Area and Astoria Column. You'll find plenty of places to visit near Portland: Cape Horn Lookout (in Stevenson), Cascade Locks (Starvation Creek State Park & Starvation Creek Ridge Loop) and Young River Falls (in Astoria). Next up on the itinerary: admire the sheer force of Multnomah Falls, look for gifts at Powell's City of Books, and take in nature's colorful creations at International Rose Test Garden. To find traveler tips, ratings, photos, and other tourist information, read our Portland trip planner . You can fly from Seattle to Portland in 3 hours. Other options are to drive; or take a bus. In February, daily temperatures in Portland can reach 51°F, while at night they dip to 38°F. Wrap up your sightseeing on the 20th (Wed) to allow time to travel to Calistoga. On the 21st (Thu), admire the majestic nature at Armstrong Redwood State Reserve, do a tasting at Porter Creek Vineyards, and then step into the grandiose world of Castello di Amorosa. Get ready for a full day of sightseeing on the next day: explore the striking landscape at Bodega Highlands, then admire the majestic nature at Bird Walk Coastal Access Trail, and then admire the majestic nature at Pinnacle Gulch Coastal Access Trail. To find other places to visit, photos, where to stay, and other tourist information, read Calistoga online trip planner . You can fly from Portland to Calistoga in 4 hours. Alternatively, you can do a combination of flight and bus; or drive. Expect a bit warmer weather when traveling from Portland in February: highs in Calistoga hover around 65°F, while lows dip to 40°F. Cap off your sightseeing on the 22nd (Fri) early enough to go by car to Monterey. Monterey is a city in the U.S. Discover out-of-the-way places like Monterey Bay and Carmel River State Beach. 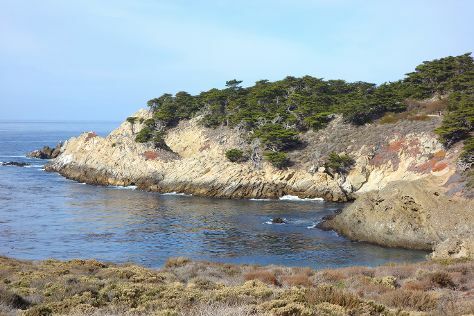 Visiting Point Lobos and Pacific Grove Shoreline Parkway Marine Refuge will get you outdoors. Spend the 25th (Mon) observing fascinating marine mammals with a dolphin and whale watching tour. Next up on the itinerary: admire all the interesting features of Seventeen Mile Drive and learn about winemaking at Taste Morgan. To see traveler tips, photos, and other tourist information, read our Monterey tour site . You can drive from Calistoga to Monterey in 3.5 hours. Other options are to do a combination of flight and shuttle; or fly. Expect a daytime high around 63°F in February, and nighttime lows around 45°F. Finish your sightseeing early on the 25th (Mon) to allow enough time to drive back home.